Let’s get the fall season going full force with some cozy butternut squash… for dessert! 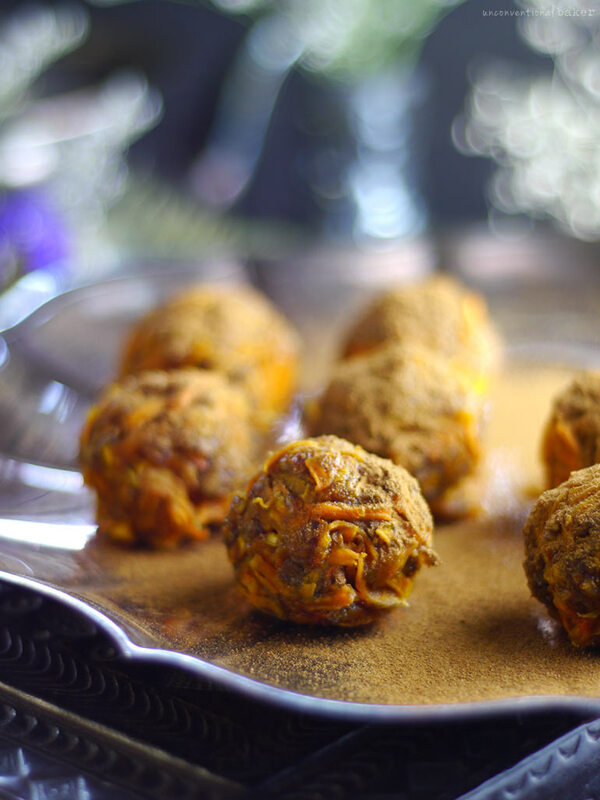 Made with saffron, rose water, cardamom, turmeric, and cinnamon, these lovely bites are bursting with delicious flavors… and thank goodness I’m not the only weirdo to blend exotic spices and a vegetable into a dessert situation! ? Nope, I’m not the creator of these scrumptious little golden nuggets, but I loved them so much I had to share them with you. 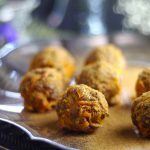 This recipe comes from a fellow blogger, Chris Anka, the awesome lady behind Tales of a Kitchen, and the author of Nourishing Noodles (where this recipe is from). I’ve been a fan of Chris’ blog ever since this epic chocolate banana caramel cake to be precise. Oh and this coconut lime cream is another huge fave (so pretty!). If you spend any time on Pinterest, you’ve probably come across those two beauties yourself — that’s how I discovered her blog a few years back, and instantly felt a strange affinity to this Aussie blogger’s quirkiness and her nourishing dessert style. So when she told me about a book she has out called Nourishing Noodles… Yep, I was all over it. Veggie noodles and I have a very special and inseparable relationship, you see. In fact, I even pack my tiny hand-held spiralizer with me on trips. Not joking… ??. The thing is while I get extremely adventurous with dessert, my approach to savory food is, I guess…uneventful? I could have zoodles for lunch for days with the same type of (good) sauce and never be bored / bothered, but when it comes to a sweet ending for my meal… a girl’s gotta have her options! Anyways I know that Chris has an interesting palate so that got me curious — just what does she do in an entire book dedicated to spiralized veggie noodles?! She sent me a copy of the book and I dove right in. So. Many. Noodle. Recipes. !! Enough to keep you entertained for a lifetime ?. There are the standard noodle meals, like you know, zucchini noodles with sauce, but there’s so much more in there I never expected to find. See what I mean?! I just barely made it into the entrees there. And while some of these may sound fancy, rest assured the recipes are quite simple to follow. I’d lose interest real fast if “easy” wasn’t part of the equation ? 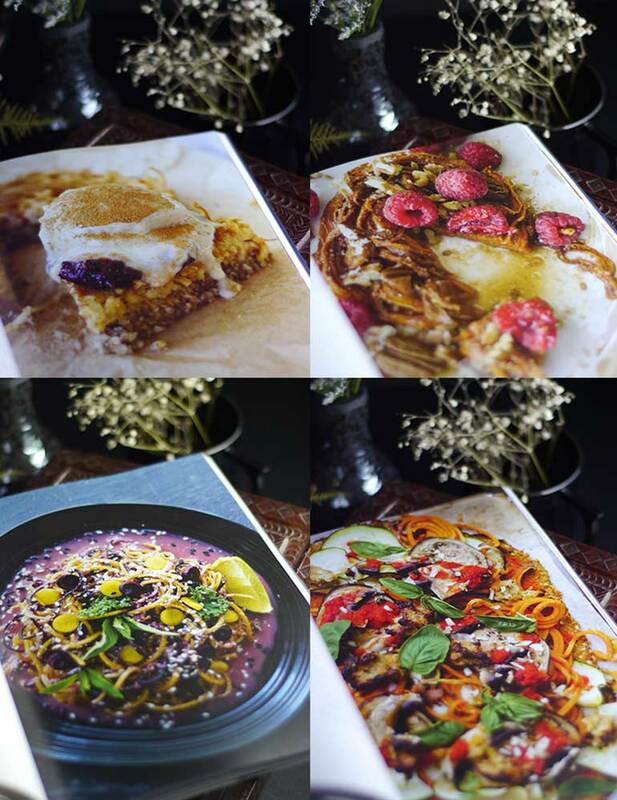 Above are some snaps of recipes from the book. Top left is a raw apple pie with blueberry jam and vanilla nice cream (? ), top right is a butternut squash pancake. Bottom left are some Thai-inspired carrot noodles with ginger-lime coconut dressing, and bottom right is a noodle pizza. I think you get the idea. If this sounds like your kinda food adventure, you can find the book on amazon or through Chris’ website for options in various countries. 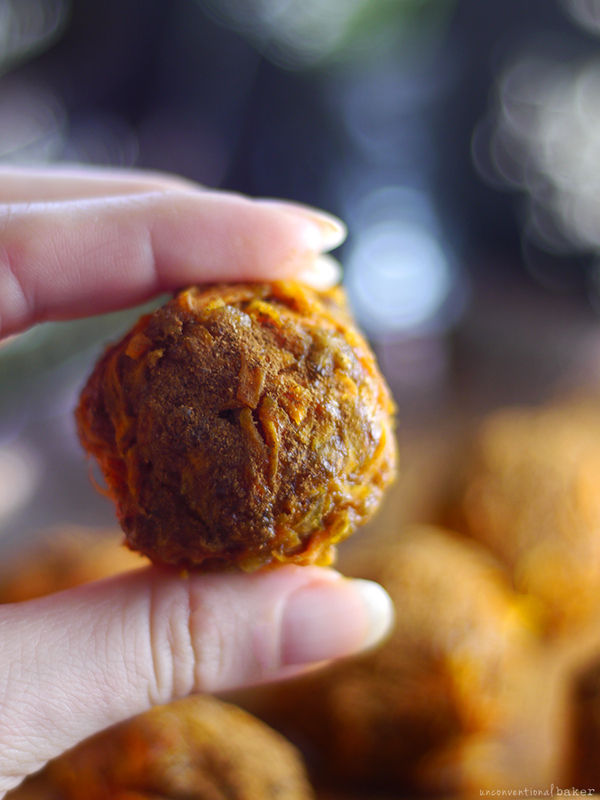 Now back to these little butternut squash dessert balls… Obv. 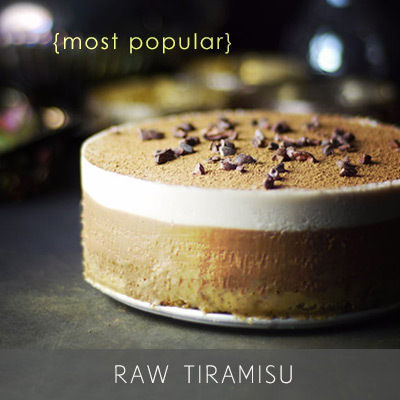 this being a dessert-focused blog I gravitated straight to the desserts section of the book. The flavor profile in these little nuggets caught my attention straight away. Rose water. And warm spices — cinnamon, cardamom, turmeric…totally my cup of tea. 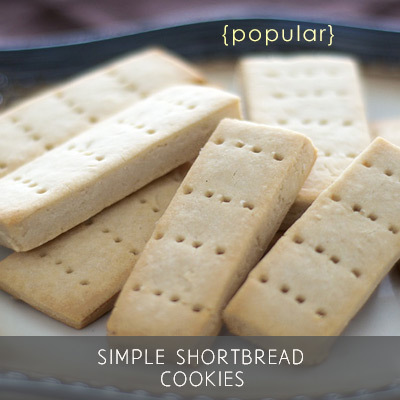 When I asked Chris if I could share this recipe here on the blog she laughed, saying something like “finally someone is appreciating these — they’re like my favorite thing”. I laughed, too. See — I told you: a quirky affinity! ?? The original recipe calls for almonds and it’s so delicious. I also tried this out with dried white mulberries instead and it was amazing as well, so if you’re looking for a nut-free option give that a try (just swap out the almonds for mulberries one-for-one). Quick note on that though — dried white mulberries don’t really dry out in a dehydrator or while baking, so you’ll need to keep that dehydrator going like 8 hours instead of the original almond-based time of 1 hour, and the balls come out softer in the end. But so yummy nonetheless! 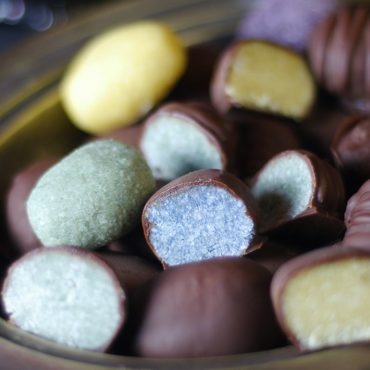 You can see a version of the inside of the mulberry ones in the photo below. Now saffron. It’s a tad pricey, I know. You can prob get by without it, but I made the effort and went and bought a little jar of it so I could make this properly — I actually tracked it down in a tiny camping town where they had this single item locked up in a special anti-theft drawer with the cashier!! That made me laugh… had a hard time picturing who was going to run off with a tiny pinch of saffron out in the middle of nowhere, but hey, what do I know… ? You can keep the recipe raw if you’re interested by dehydrating at a lower temp — 108F or below — for a slightly longer time period. Final note on spiralizers: I used my tiny hand-held one for all the recipes I’ve tried from this book and I squeaked by just fine (though I did have to chop the squash for a recipe like this one first to fit in there). If you’re serious about noodling or want a more comfortable to handle spiralizer, something like this is much more convenient. But I’m fairly mobile these days, so the small one suits me personally just fine — so don’t feel like you need anything fancy to get the recipes in this book to work for you. 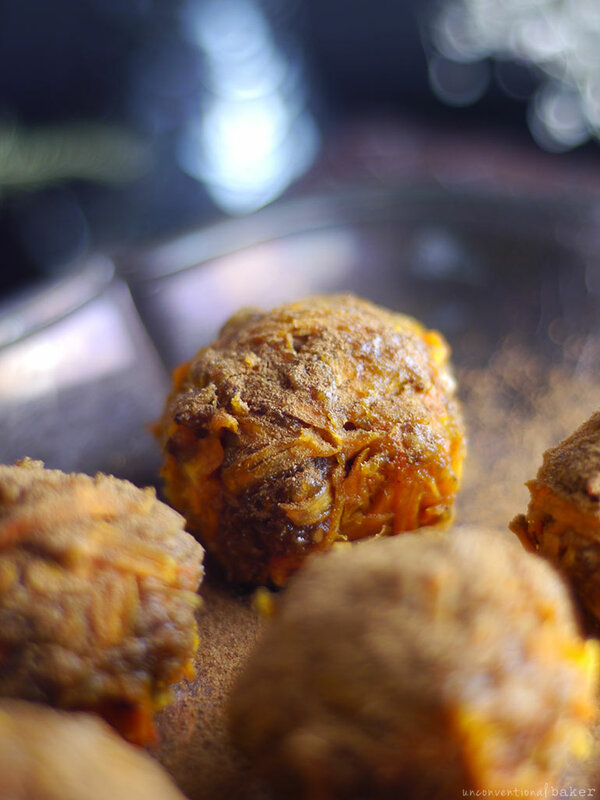 Spiced vegan dessert balls made from butternut squash noodles! Great way to add sneaky veggies to a dessert. Gluten-free and refined sugar-free. Except for the cardamom, place all noodle ingredients in a large bowl. Massage noodles for 30 seconds, then let sit for 2-3 minutes. Add the ground cardamom seeds to the noodles. Place the almonds and soft dates in a food processor and pulse until crumbly and sticky. Add this mixture to the noodles. Using wet hands, combine the noodles with the ingredients in the bowl, then form the mixture into 7-8 balls. Arrange balls on a dehydrator mesh tray and dehydrate at 125F (52C) for about 1 hour (I didn’t use a mesh sheet for mine as my dehydrator is the circular kind, and it worked fine too). If you don’t have a dehydrator, simply arrange balls on a baking sheet lined with parchment paper and bake at the lowest oven temperature with the door ajar. Keep an eye on them, as they will be ready in less than half the time required for dehydration. 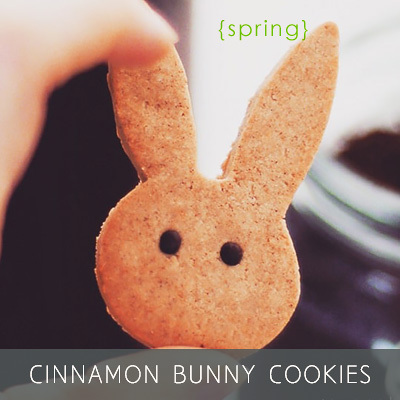 Serve warm with a dusting of cinnamon. 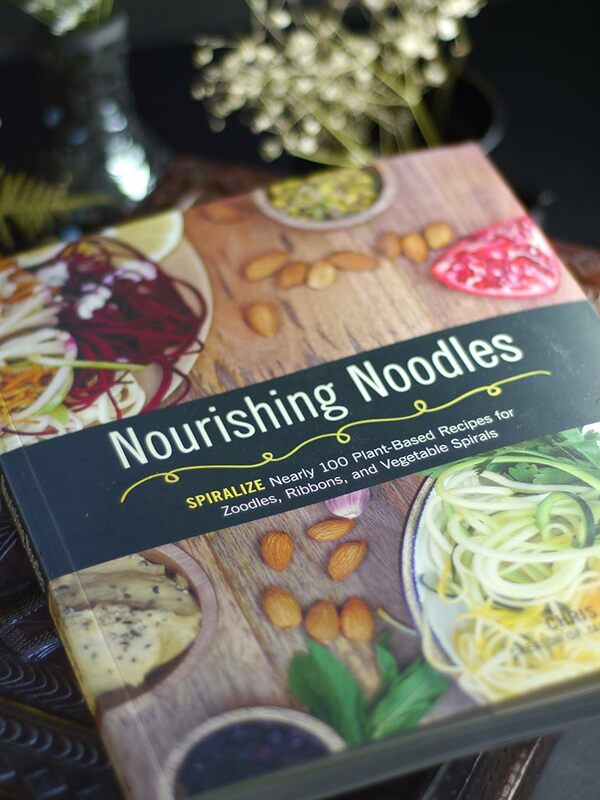 This post contains affiliate links to a hand-held spiralizer, a stand-up spiralizer, and the nourishing noodles book. I live in Turkey and instead of butternut squash, I need to use pumpkin. I cannot compare the size of both. How many grams of it am I supposed to include for this recipe? Thank you! Delicious! And what a yummy book! I’ll definitely be adding this to my reading list! Thank you for sharing Audrey. Happy to share, Ashley :) You might like Chris’ blog too — she has so many lovely recipes on there. 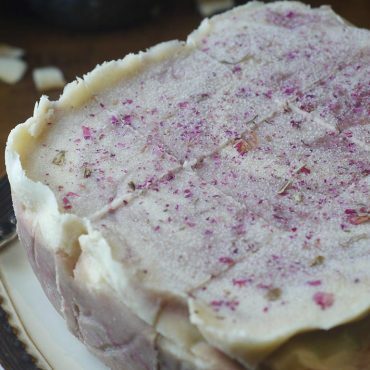 Lovely recipe that looks well worth trying. I must say, Audrey, the photography on your website ins absolutely gorgeous. I appreciate the attention to detail. I follow Anca, she is amazing ! Will need to get her book too! I make part from the same club, Audrey, as I also take always my spiralizer with me on trips( I only have one but small and old, received from my mum maybe 10 years ago). I have never tried butternut in other desserts than cakes/tarts, but these bites sounds original!!! 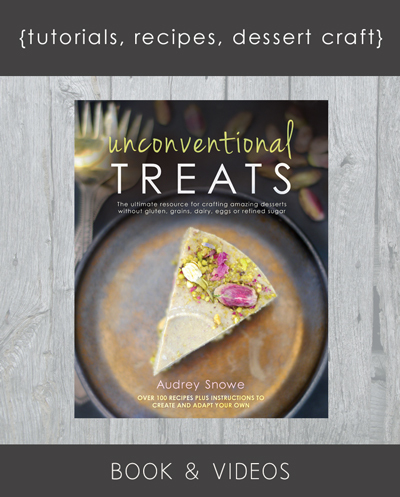 Thanks for the review about Anca’s book, Audrey! You’re welcome, Natalia. I have an extra copy by the way — would you like it? :) I’d be happy to ship. Who would say NO to such a question? But how can I thank you? No need :) I like seeing things go to people who will make use of them! I just looked through my emails — is your address still the same (Tenbroek)? If not, email me where you want it shipped. Wowza, that is some serious noodle creativity! A whole book about veggie noodles already sounds very fun to me, but those pictures? And now that I know there’s a dessert section I am so intrigued. 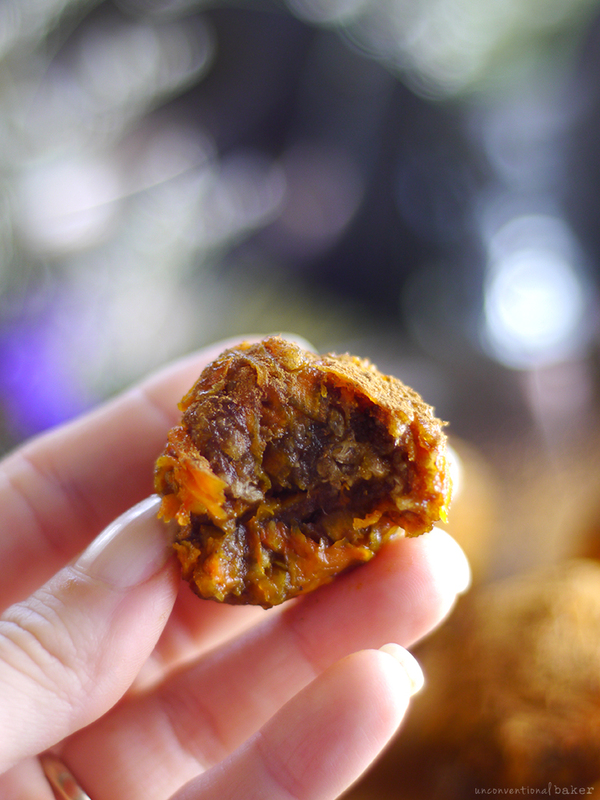 I will happily appreciate these little squash-y dessert bites right along with ya!